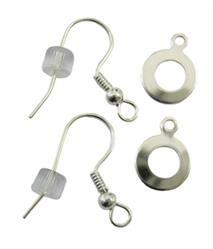 For attaching the ring at the end of a jewelry chain to the wire loop on a stained glass pendant. 3/8" long. Split metal ring for joining the two ends of a jewelry chain together to receive the bail. 5/16" inside diameter.